Specialized dispersive juveniles of the nematode Bursaphelenchus mucronatus (J4d) were obtained from adults of the black fir sawyer Monochamus urussovi. Judging by the structure of their genital primordium and the primordia of copulatory organs, they correspond to the 4th stage juveniles of the propagation generation (J4), which feed as mycophages and parasites in the conifer wood tissues. The dispersive juveniles differ from those of the propagation generation in such characters as reduction of the stylet, inner cephalic framework, and parts of the pharynx (the median bulb and the pharyngeal gland lobe), a sharply conical tail, and the presence of unicellular glands at the anterior body end. 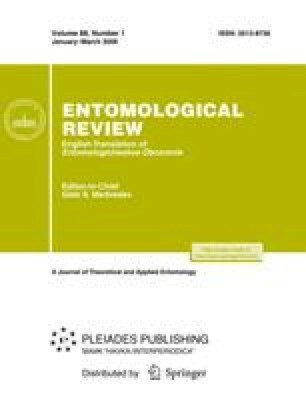 Among entomophilic juveniles, the prospective males and females can be distinguished by the structure of their genital primordium and the primordia of copulatory organs. Original Russian Text © A.Yu. Ryss, 2008, published in Entomologicheskoe Obozrenie, 2008, Vol. 87, No. 1, pp. 221–229.